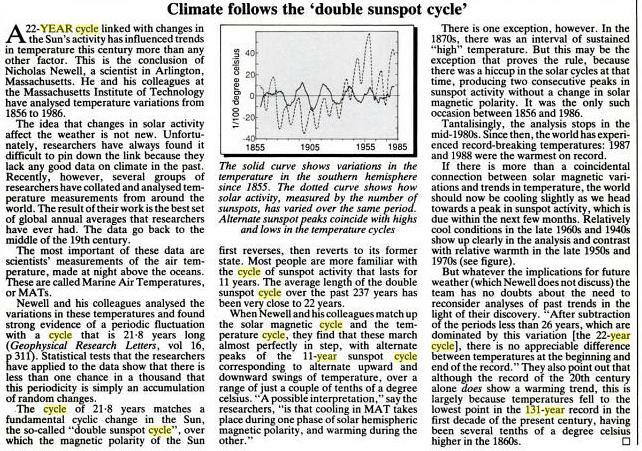 Here’s an old 1989 article from New Scientist showing a correlation between the ‘double sunspot cycle’ – the Hale cycle, and night time marine air temperatures in the southern hemisphere. Of particular interest is the observation that there were two consecutive 11 year Schwabe cycles with the same polarity in the late 1800’s, coincident with high temperatures. I’m having trouble finding any other references to this event, can anyone help? Link to the Newell article. Newell’s NMAT record (which, incidentally, is detrended) matches the Hale cycle quite well between about 1885 and 1965, but the correlation breaks down after 1965 and before 1885 it’s negative. There’s a similar temperature/Hale cycle match in the CET record between about 1760 and 1870, but again it breaks down after 1870 and before 1760. I think the reason we get matches only some of the time is that the “temperature” cycle period doesn’t quite match the Hale cycle period. The S. Hem NMAT record, for example, shows five temperature cycles between 1863 and 1958 (i.e. period 19 years) and five Hale cycles between 1870 and 1980 (i.e. period 22 years). In the CET record it’s the other way round (13 Hale cycles in 280 years but only eleven temperature cycles.) Obviously there’s more going on here than meets the eye. But even if the Hale cycle does have an impact on temperature I don’t think we can claim that “climate” follows it. The overall impact of the seven Hale cycles between 1740 and 1890 on CETs was zero – mean temperature was the same in 1890 as it was in 1740 (9.2C). If we accept that climate is weather averaged over 30 years the Hale cycle is too short to have a long-term impact on climate anyway. O/T, but I have to make the observation. Isn’t is interesting how historic temperature records, which many think aren’t worth the disk space they’re stored on, always seem to show some correlation with solar activity? And the Southern Hemisphere NMAT record is about as ratty as it gets. Using the longest instrumental record of Central England temperatures (starting in 1659), the period of the strongest peak is 24.29 years with a secondary peak at 22.74 years. The data runs for long enough to say that even this secondary peak is almost certainly not the Hale cycle period. It’s frustrating that exact period matches are so rare. Cycles interactions are complex when many periods and harmonics are involved. The whole solar system is ringing like a set of bells, and the Earth responds at a bunch of frequencies; 45 years in the far north, ~60 years in the tropics, ~75 years in the north Atlantic etc. Ray: According to the observational sunspot record the average period of the Hale cycle is about 22 years, but individual cycles have periods ranging from 18 years to 29 years. So a couple of dumb questions. First, how well does cycles analysis work on cycles with variable periods, and second, are the Hale and Schwabe cycles the only solar cycles with variable periods? Hi Roger, I think that those extremes have now been reduced (the 29 year one in particular). (1) When cycles analysis is done on cycles with variable periods (which actually means *all* of them) the result is details around the spectral peak. In the case of the 11 year cycle, there are 3 main peaks at around 11.8, 11.1 and 10.0 years. If we had longer periods of data these would show further details. The same happens in atomic spectra – what at first seem sharp lines resolve into further details under magnification, with more lines that also resolve when magnified (look up fine structure and hyperfine structure). (2) I think that the first question answered this too. All cycles are variable. Even the solar rotation is variable, over time, by latitude and with depth. Many solar cycles depend on rotation. Then there are the set of cycles 77 days, 154 days and others (see http://www.cyclesresearchinstitute.org/cycles-astronomy/CRI200510-solar154day.pdf including the 3 peaks in the Russian spectra). (3) I am planning to develop a macro in CATS (see http://www.cyclesresearchinstitute.org/cats/index.shtml ) that will do diagrams showing amplitude and phase of cycles over long periods of time. When I do this I will do graphs for 154 day, 11 year, 208 year etc for the Sun. In general such phase variations also show cycles. There is no end to them. More often the Ea/Ve syzygies around odd numbered solar cycle maximums will be producing positive temperature deviations, while at even numbered cycles they more often produce negative deviations. These relationships will at times get completely reversed due to the positions of the three outer gas giants relative to the Ju/Ea/Ve syzygies/angles around the maxima. SC22 is a great example of a strong even numbered cycle. Vuk, nice plot. I wonder if the AMO plot is skewed by the~75 year cycle found by Harald Yndestadt in the northern Atlantic. Ulric, how’s it going? I suppose the ever changing never repeating planetary situation makes it hard to formalise the relationships. It makes it tricky to predict anything numerically. Interesting graph of yours. The AMO, PDO and SOI show largely unrelated periodicities, and except for a minor peak at 22 years in the AMO there’s no sign of the 11 and 22 year solar cycles in any of them. So can we conclude that the AMO, PDO and SOI (and probably a number of other ocean oscillations as well) are unrelated to solar cycles? Or is it just too complicated for us mortals to figure out? Or is it just too complicated for us mortals to figure out? To us mere mortals solar activity as represented by the TSI is of great interest only if it has significant effect on the climate. For some time now I accepted that the TSI ‘wattage’ variation is insufficient. The magnetic activity (or more importantly lack of it) is the next factor which needs to be taken seriously. No idea, but AMO spectrum looks pretty clean to me. Safe cheers, I thought you were heading down this way sometime ? With the positional rules I have established, it is straight forward to predict when either type of solar cycle will be augmented or diminished, and the relationships are easily formalised. Prediction is best done visually from the angular relationships. With regard to any regular impact of the Hale cycle on climate, the double Hale shows up in precipitation, and the SOI and maybe PDO looking at Vuk`s graph above. I would caution about too elaborate interpretation of the graphs. – I use 11 year moving average (11y ma) when looking at medium and longer term, this type of filtering is visible in the dip around 11 year signal. – the PDO and SOI (southern oscillation index) are for all practical purposes probably are the same. I would consider SOI (closely correlated to ENSO but of the opposite sign) more accurate since it is just difference in atmospheric pressure at the two specific points (Darwin-Tahiti), while PDO is a complex calculation of the SST anomaly in a belt of the North Pacific. – Hale cycle 22 and sub-harmonics 44, 66 years certainly should not be totally ignored, but if they are meaningful, than should be present in all indices to a similar degree. – Finally, lot more of supporting evidence is required. Effect of the 11 ma filtering can be severe on the shorter periods (< 2 x 11 years), but then it is difficult to separate what is due to the solar cycle from the random occurrence. The effect differentiation of variation in precipitation and surface temperature on land and sea might have on longer term cloud cover change. Bob Tisdale has shown how ‘steady’ the southern Pacific is compared to the Atlantic in terms of longer term temperature variation. Seems to me the solar (magnetic) variation of the 22 year Hale cycle is affecting the southern ocean more than the 11 year solar cycle effect on GCR’s or whatever. Grist to your mill I would have thought. Thanks for the additional plot Vuk. That;s a very tight spike around 5.6 years isn’t it? 1/2 Schwabe 1/4 Hale. Hmmm, Funny what you find hiding in the ‘randomness’ of ENSO… Is it there in the SOI data too? However, I’m not sure that the ENSO period is as long as 5.6 years. Between January 1982 and January 2010 the Niño 3.4 index shows eight distinct peaks spaced 3 to 5 years apart with an average separation of about 3.5 years. (Note that I’m looking at all the peaks here, not just the ones that exceed the arbitrary El Niño threshold.) I tried to eyeball a 5.6 year cycle into these peaks but couldn’t do it. and calculated annual values for the spectral analysis. I did quick test: Using the Excel trend line plotted 3 year moving average and marked prominent peaks. from 1880-2005 (125 years) there are 22 peaks (one or two may be a bit doubtful) which gives average period of 5.68 years. If you have the time you might try a spectral analysis on the Niño3.4 index (http://climexp.knmi.nl/data/inino5a.txt). I’d be interested to see what you get. Thanks Vuk, that’s really instructive regarding the interpretation of FFT. I wouldn’t have expected such ragged data to produce such a clean narrow spike. But the question is, why at half the solar cycle length? 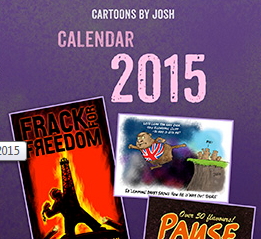 @tallbloke: the time of a peak current at the peak of the solar cycle? Rog, There is a negative correlation at the start, changing to positive and then back to negative. The 45 year slightly phase leads satellite sea level data but upside down. Is that logical? Just chance stuff I expect. The data is upside down, assuming El Nino should be upwards. I could be wrong, but it looks as the 20 year period is initiated by the ENSO, since it is lower in the SOI and the lowest further north in the PDO. The 40 year cycle appears to be the predominant throughout the Pacific. I don’t use log scale since I am more interested at the longer periods rather than high frequencies at the bottom end of the graph. Hmmm, the peaks around 10 and 23 years are promising. Thanks again Vuk. Vuk: Thanks for running the Niño3.4 analysis. It shows what I would expect to see – comparatively strong short-period peaks but relatively muted longer-period peaks. The reason for this is that the ENSO indices are constructed to emphasize short-term cycles and suppress longer-term ones. So if we want to define longer-term ENSO cycles the ENSO indices aren’t the ones to use. There are problems with the PDO too. It’s of limited use in defining ENSO cycles because it’s based on Pacific SST anomalies north of 20N – i.e. outside the ENSO area – and it’s of questionable use in defining cycles in general because it’s calculated from the leading EOF of these anomalies, so its frequency spectrum won’t be the same as the frequency spectrum of the SST data it was based on. The AMO is probably OK because it’s constructed by straight-line detrending of North Atlantic SST anomalies. However, we might still be better off without the detrending. My conclusion is that there are too many problems with SST-based ocean indices to use them for cycles analysis. I think we would get a much better idea of how the oceans slosh around by performing cycles analyses on the raw, unmassaged ICOADS SST record – after discarding the bad WWII data between 1940 and 1945, that is. Well that’s strange. Vuk has changed his Nino curve and now the spikes at 10 years and 23 years have gone. But the legend says X2 implying he just doubled up the amplitude. There are number of Nino data from areas 1-5. If you look at table for Nino 3 and Nino 3.4 they are different. First graph was for Nino3, current for Nino3.4 which appears to be in latest fad and with up to date data. Ah, thanks Vuk. Is there any chance of publishing the Nino 3 graph and Nino 3.4 graph together? The antiphase of a couple of the periods is very interesting, and might provide us with some clues when we consider the locations of the geographical areas and Rossby wavelength etc. I just had a quick look at knmi (enso) and noaa (nino 3 & 3&4 and the trans nino index -tni) they all look different. Perhaps Roger Andrews could suggest which is most relevant or representative. I personally prefer the SOI since it is actual measure of the atmospheric pressure at two fixed points with the real values. The ENSO indices that I’ve compared (Niño12, Niño3, Niño4, Niño3.4, multivariate, bivariate) actually aren’t all that different. The differences that do occur originate mostly because they’re based on SSTs measured in different parts of the Pacific Ocean. According to its authors the multivariate index is the best, but it goes back only to 1950. Of the longer-term records Niñ03.4 is probably as good as any. The problem as I see it, however, isn’t what Niño index to use but whether to use a Niño index at all for cycles analysis, because they’re all detrended to the point where any low-frequency components that might originally have been present are just about entirely gone. Take a look at the KNMI plot of Niño3.4 at http://climexp.knmi.nl/data/inino5.png and you will see what I mean. I might have added that the ENSO indices are commonly detrended by subtracting North Pacific SST anomalies from SST anomalies in the ENSO areas. ENSO and North Pacific SST trends are uncorrelated, so i guess this would also tend to distort the frequency spectrum of the ENSO indices.